Ever since the internet was born, learning new things is no longer limited to the classroom setting. Chances are, you could teach me something useful that I don’t already know and you could also do the same thing online with thousands of people, earning an income from your skills and knowledge. In other words, you can learn how to make money selling online courses. Here are some tips to help you get started. What’s The Trend for Your Skills? The most common mistakes that people make is that they think they need to have a certain qualification to teach something online. That’s not entirely true. While some niches do require you to be a professional, most niches don’t. As long as you speak or write with experiences, people will naturally flock to you for the knowledge. The first thing you need to do is to understand how people search for information online. For example, when you want to learn about something, what do you type in Google Search? You would ask short questions or use keyphrases, right? Buttermilk, Spanish and apps – these are three interest that have a great upward and on-going trend which means, people are willing to pay in order to acquire the knowledge. So when you are planning an online course, you want to be following the trend as close as possible. What Are The Basic Tools That You’ll Need? The first thing that you need is a domain name which is the web address that will direct people to your online course. It doesn’t have to be anything fancy, but at the very least, it should reflect what you want to teach. Similar to coming up with a business name, it should also be easy to remember. You can buy a custom domain for a small amount of fee that’s renewable every year. Here’s an example of a domain name that’s available at SiteDomains for $13.99 that includes an email account, WhoIs Privacy and Protection. The next step is to connect the domain to a website and my favorite choice would be to use WordPress. The advantage of using this platform is that you can customize the site using various plugins and see which one works best for delivering your courses. For that to work, you’ll need to search for a good hosting service to ensure that there are no (or minimal) technical hiccups during the teaching process. Alternatively, you can also use a Learning Management Software (LMS) that offers teaching solutions out of the box which comes with hosting packages and website builders. You can check out some of these popular LMSs for more information. Just like social profiles, you should also consider creating social media accounts specifically for your classes. This doesn’t mean that you will teach directly on Facebook. Instead, you’ll be posting information/activities/blogs from your website to update the communities around you. When people read your social posts, they would also be directed to your website, contributing to your overall online traffic. To give you an idea, here’s an example of a chef sharing his cooking skills on Facebook. Online learning can be quite distractive because these days, people tend to multitask a lot on just one screen. To ensure that your students focus on the course, video tutorials are great for creating that kind of engagement. In fact, videos are thought to deliver a certain message more effectively and help students understand a topic better. Professional video making tools like Screencastomatic is a good choice if you want to enable more features. If you prefer something more budget friendly, you can always use YouTube Capture (iPhones) or YouTube Creator Studio (Android) to take videos right from your smartphone and upload it onto YouTube. Since hosting is free, you can create as many videos as you like and funnel those traffic to your main site for people to check out the details of your course. At some point, you may need to create designs – whether it’s for a website logo, course outlines or eBook covers. Hiring a professional can cost you a bomb, so why not do it yourself? Canva is my go-to graphic design app because they are easy to use and have plenty of stock images to choose from. When it comes to creating infographic, which I think is great for teaching, Piktochart is a great program to use. Both of these tools come with free and paid packages, but for beginners, I find that the free versions are more than sufficient. 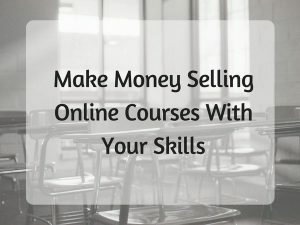 How to Make Money Selling Online Courses? The first step to this is to show people who you really are so that they know how much to trust your expertise. Here are some ways to go about it. Provide a Transparent Contact – There are 3 important information that you need to have; an About Me page, a Contact Page, and a phone number (if you have a physical business). This information reflects your validity and provide convenience for people to get in touch with you. Blogging – Keep an active blog on your site. Share your knowledge, what you’ve learned and what’s new within your niche. Remember also to create engagement by inviting readers to leave comments on the article. Blogging routinely generates new content which helps in search and social ranking too. Product List – Your main product is your course and you want to make sure that the list is visible to anyone who’s interested to sign up. Show them clearly what they would be getting and how much it would cost them. Breaking down lessons into different categories will help people make better decisions on what they want to learn. Bonus Offer – Consider setting up a free trial OR offer a beginners eBook for free. Although you may not be making money with these, when you give people more than what they expect, they are going to say good things about you. And that will result in positive marketing for your brand as well. Check Your Competition – Find out who are your competitors on the first page of Google and check out the courses that they provide. Are their programs any better? Do they charge at a cheaper fee? How can you make your courses more appealing than theirs? These are some of the questions that you need to consider. Get Testimonials – If you can get positive reviews from any of your previous students, add that into your website as it would improve your credibility. When people read about good experiences of others, they are more inclined to try things out themselves too. Join Affiliate Programs – Besides your primary product, affiliate products can compliment your online courses too. Although not every teaching niche would benefit from this, if you think there are certain tools that can be useful to your students, recommending these products is as good as getting people to check out your courses. Pay For Traffic – If you have the budget, paying for targeted traffic is probably the best way to grow your teaching business. It’s pretty similar to creating an advertisement – you are looking for that specific group of people that are highly interested in your course. PPC can be very profitable if you know how the system works. If you wish to learn more about this monetization technique, here’s a series of PPC lessons that can help you out. As more people get access to the internet, online learning in any kind of niche is only going to escalate over the years. These basic tools that I’ve mentioned are readily available and with some diligent research, you’ll be able to share what you are good at through online courses and create a teaching business as a result of that. Remember, you only need to teach one thing to your audience, deliver it over again and the crowd will naturally come back for more. So, what do you think you are good at? Head over to SiteRubix to create your first WordPress website OR join my recommended online training platform to learn more. Do you have any thoughts or questions about this topic? We would love to hear about them in the comment space below. Hey, very good article and very valuable information when applied to a business. Thanks to the internet we all have a wonderful opportunity to share our knowledge and experience with others online (giving value) and in today’s world, value can be worth big money. Video marketing is a win-win type of business, but can be very frightening to beginners (It’s hard to put ourselves out there from the beginning). You article is very helpful and I am sure it will inspire many people to start this wonderful online journey. Hi, I was hoping to see practical information but this part is missing. When you create a course, what are practical steps for selling it? I have no idea where one should start. How you charge? How you collect the money for it? This is information I am looking for and do not find it. It does not have to be a separate course, it can be just a part of the site with charge. How to do this? Thank you. Thanks for your question, Jovo. Payment collection is important, but it would be too much to cover in this article that focuses more on the preliminary steps for creating online courses. I wrote an article not long ago about how to use PayPal on a business website so you should be able to find more information there. I hope this helps. Hi Cathy, I started my own blog a few months ago and at first, I was thinking about writing posts about art and using affiliate marketing as a tool. But after reading your article it really made me think about using my own skills in video tutorials. I’m a teacher and art professional and this is actually something that might work! Do you have any suggestions of how I can make this transition (maybe through e-mail marketing the videos?). Thanks. Your initial plan is actually a good plan. In this guide that I wrote about how to start an art business online, I mentioned about leveraging from affiliate products as an income source. You could create tutorial to show how you use this products and their techniques to create an art. Once your traffic starts to grow, you could incorporate opt in (email marketing etc.) for your online courses because people already know that you are an expert in this field, due to the number of content/blog that you have published. What an awesome article you have written. You have covered so many topics for such a big subject. Creating courses online is something I have thought of, but shrugged off because I felt I didn’t “qualify”.Your post gave me the confidence to look past the qualifications. Thank you for all of the valuable information inside. I was just searching for a video creator software program. Also great recommendation for the free website with Siterubix – you really can’t beat that deal! Thanks again for your time and effort into writing such a valuable article for us fellow entrepreneurs.